"Is it supposed to look like that? It's all bent", says your crew as she looks down the mast while you hook up the step. When you figure out she's talking about the mast, you take a look, and it looks like the esses at Mid-Ohio. There are two steps in mast tuning. 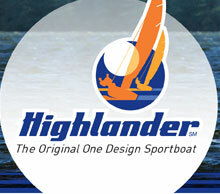 Diamond tension and straightness are mutually attractive to the well being of the racing Highlander. The two can be adjusted first one, then the other, or you can tweak both at the same time. The easiest is probably to get the tension right, then get it straight. With a properly tuned mast the boat will set up the same on both tacks (point the same, go the same speed), the mast will bend forward easily to flatten the main in heavy air and the mast will bend sideways at the top to de-power the top of the sail. The "tension" is best measured with a Loos tension gauge. Buy one or borrow one, they are cool. The tuning guide expresses the tension as the number reading on the gauge. Each pair of diamond wires should have equal numbers. The North tuning guide specifies 15 to 18 for the two lower diamonds, 4 to 6 for the upper. The proper tension prevents the mast from bending sideways until the boat is overpowered, then the mast will begin to bend sideways to "spill" air from the top. Adjust the tension with an open end wrench or an adjustable wrench. Do not use pliers or "Vise Grips" or you may damage the nuts, bolts or diamond wires. To straighten the mast, sight down the slot and see which way the mast is bent. You should notice where most of the bend is located and concentrate on that pair of wires to begin straightening. If the bend is only down low (like in the figure), start by adjusting the lower wires. Once the tension is correct, it is important to adjust the wires evenly side-to-side. If you tighten two turns on the left wire, make sure you loosen two turns on the right wire. That way the wires will maintain their tension fairly well. Double check the tension after you get the mast pretty straight. This can be a tedious procedure the first time, but once you've done it a couple of times, you'll be a pro.